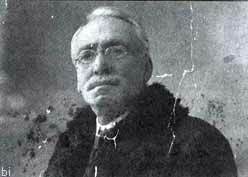 Benedetto Radice was born in Bronte on February 1st of February 1854. He made the studies of "humanity grammar and rhetoric" in the Capizzi college and then, at the university of Catania, obtained diploma in "causidico" which was like qualifying for the forensic profession. But after a short experience as a lawyer, chose teaching. Leaving behind Bronte, city of the Cyclops, around 1888 he moved to Rome his first stop and then to Florence, Sondrio, Fiesole and Empoli, where he taught for a long time. The vitality of his ingenuity, the vivacity of character, the witticism with which he embellished the conversation, soon gave him sympathy and friendships and facilitated contacts and paid occupations, giving him - at the same time - a way to learn. Rome seduced him so much and spent his free time studying Roman and Christian archeology, making a living as a tour guide for tourists. Knowing the French well and mumbling the English language as well, he was happy when he could mingle with the tourist groups to show off his culture and explain to them with grace and disinterest, the meaning of a ruin, the value of a monument, the beauty of A work of art. These contacts with foreigners gave birth to the desire to deepen their knowledge of their languages ​​and visit their countries. After passing the competition, he is qualified to teach French and since 1889 we find him in Ceccano (province of Frosinone) teaching at the Berardi College. 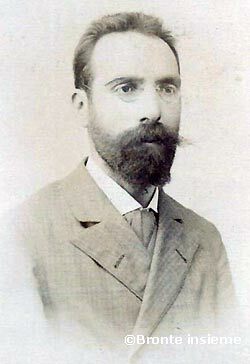 Leaving Rome, in 1892, the Root moved to Tuscany, the cradle of the Italian language, most likely first in Fiesole at the Scuola-Convento degli Scolopi and, after in Empoli, where he published the Italian translation of "Le favole di La Fontaine" that dedicates to the old parents "Sor Nunzio and Sora Marianna" who has not seen for many years and now become grandparents. He also met the one who was to become his great friend: Renato Fucini, then a royal school inspector and writer, who was his advisor and protector. In a photo sent to Fucini (see on the right), kept in the Riccardiana Library of Florence, the same Radice then thirty-eight, so he wrote the dedication: "Benedetto Radice to his benefactor, Renato Fucini". Benefactor but also a friend and a lasting friendship that the distance and the years, more than fade, will strengthen, expressing themselves in a dense correspondence and in mutual gifts and in the imposition of the name (Renato) to his only son. In Empoli, where he continued teaching, Benedetto Radice also founded a peasant cooperative and published studies on "Italy and the Papacy" and "The English in the Italian Risorgimento. Here he had, as a colleague, Ettore Romagnoli, then very young, who then had to turn out to be the greatest translator of Aristophanes and the tragic Greeks and also frequented Ferdinando Martini, Olindo Guerrini, Giosuè Carducci. In 1893 he taught in Sondrio and, two years later, in Varese where, in his spare time he found numerous historical monographs, he collaborated in numerous magazines (Journal de Bordighera, La Squilla, Illustrated Literary Gallery, Cordelia, Il pensiero of Sanremo, L'Esare, etc. ), and during the summer holidays it turns Europe up to the North Cape. In 1903 he went back to Sicily, to Palermo. Had personal relationships with important Sicilian culture of the early '900 (Verga, Gentile, Pirandello, Capuana and Giuseppe Lom­bardo Radice with whom had some relationship ties). Back to Sicily, started to investigate the history of Bronte and the near territory. He dedicated to Bronte quite a lot of historical essays which, in the field of the native history, constitute a fundamental and absolutely indispensable news base. Proud of his town of origin, and being a great scholar, got ready, (as he wrote), «with ardor to rummage through old registers and documents, to cover the countryside, search, investigate, question ruins, tombs, coins» for over fifteen years. The fruit of his tireless work was the "Memorie storiche di Bronte" (Historical memories of Bronte), whose first volume was published in 1927. Benedetto Radice brought to light and analyzed the nodal moments of our past, covering all the modern and contemporary history of the country, through serious and careful archive sear­ches. The Radice literary property was given by him to benefit the local Civic Hospital. Between the other very many books written by him, besides the most famous ("Historical memories of Bronte", Bronte, 1827-1928), there are "Nino Bixio in Bronte", "Bronte in the revolution of 1820" (Palermo, 1906) , "The farmhouse and the abbey of holy Maria of Maniace" (Palermo, 1909), "Arcan­gelo Spedalieri biography" (Palermo, 1914), "The Aetna: meek eruptions and legends" (Rome, 1925), "Two Sicilian glories-the brothers De Luca" (Bronte, 1926). He also published a translation of the fables of La Fontaine and studies on "The Unity of Italy and the Papacy" (Ventimiglia, 1895) and "The English in the Italian Risorgimento" (Livorno, 1901). The integral edition of the Memorie storiche di Bronte We offer it to You in format . Benedetto Radice was born in this house of the old central part of Bronte. 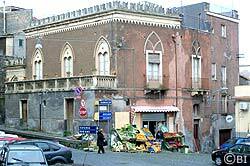 The building faces the street which takes the name of the writer, the high steps of the San Blandano church and is close to Annunziata street where another famous house rises, that of the Cimbali brothers. The photo below, sent by the Radice to the Tuscan writer Renato Fucini and kept in the Riccardiana Library in Flo­rence, reports the following dedi­cation: "Benedetto Radice to his benefactor, Renato Fucini". 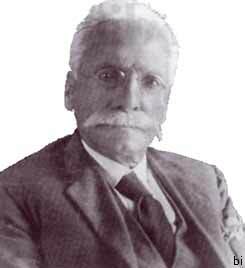 Benedetto Radice died in Bronte the night of May 15, 1931 at the age of 77 while still working on his writings already published and in the process of publication. «Benedetto Radice's life was that of a cultured man, of rigorous studies and independent judgment [...] to establish on the plane of history a truth - on which lies and rhetoric had accumulated to hide it - already learned, undoubtedly, in the years of childhood, on the level of feelings, human relationships, memories of people close to him. The truth about what was called "the facts of Bronte", the atrocious facts that ran in the summer of 1860 in the poor Etna country that had given him birth. Other writings by Benedetto Radice (short stories, novels, commemorations, epigraphs, ...), some published by him in many newspapers and magazines of the time, other unpublished, have been recovered and collected by our Association in a book to which we wanted give the title "Il Radice sconosciuto" (The Unknown Radice). Publishers' own series, September 2008, ISBN 978-88-902110-5-8. Benedetto Radice, ”possessed pride not easily subdued; sincerity that unburdened itself with bi­ting sentences; A heart that even getting older continued to burn with youthful enthusiasm; a courage that could look coldly the face of risk. In a season, very mournful for our country town, when the cholera epidemic hit us with destructive violence, emptying entire families, he, against the fearful who were running away from contagion, gave a noble example of abnegation and bro­therly love. Benedetto Radice’s dedication and love towards his fellow men was also significantly ackno­wled­ged by the Ministry of the Interior that granted him a silver medal with a meritorious sanitary diploma. To the left Benedetto Radice in a drawing by Mario Schilirò and, below, the cover of the book edit by the ex Banca Mutua Popolare di Bronte that contains nearly all his works. Memorie storiche di Bronte, vol. 2° (Stabilimento Tipografico Sociale, Bronte 1936) post.